Born July 1, 1961 I Karnal, India. Kalpana Chawla received a bachelor of science degree in aeronautical engineering from Punjab Engineering College, India, a master of science degree in aerospace engineering from the University of Texas, and a Ph.D. in aerospace engineering from the University of Colorado. She is survived by her husband, J. P. Harrison. 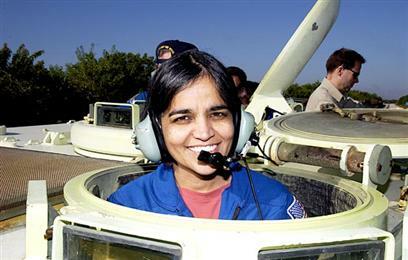 Kalpana Chawla was the prime robotic arm operator on STS-87 in 1997, the fourth U. S. microgravity payload flight. STS-87 focused on how the weightless environment of space affects various physical processes. In January 1998, Kalpana Chawla was assigned as crew representative for shuttle and station flight crew equipment, and subsequently served as lead for the Astronaut Office’s Crew Systems and Habitability section. Chawla was the flight engineer and mission specialist on Columbia STS-107. The mission ended abruptly when space shuttle Columbia and its crew perished during entry, 16 minutes before its scheduled landing. Kalpana Chawla made the ultimate sacrifice and lost her life in service to the national and the space program on February 1, 2003 at 41 years of age.